"When you're looking for something completely different to use up those turkey leftovers, this could be it! A tender, eggy pasta-like crepe enfolds the cheesy, amazing filling. You can make the crepes and filling ahead of time." Whisk 2 eggs, flour, water, salt, and 1/2 teaspoon olive oil together thoroughly in a bowl to make a very smooth batter. Cover bowl with plastic wrap and refrigerate batter for 1 hour. Mix turkey, ricotta cheese, 1 egg, 1/2 cup Parmigiano-Reggiano cheese, mozzarella cheese, marjoram, red pepper flakes, and 1/4 cup Italian parsley in a bowl until thoroughly combined. Season with salt to taste. Place a nonstick skillet over medium-high heat and brush generously with 1 teaspoon olive oil or as needed. Swirl about 1/4 cup batter into the bottom of the pan and tilt to form a thin pancake covering the bottom of the skillet. Cook until bottom of crepe is dry, 60 to 90 seconds. Flip crepe and cook until other side has small browned spots, 60 to 90 seconds more. Repeat with remaining batter to make 6 crepes. Transfer crepes to a plate as you make them. Spread about 1/2 cup marinara sauce into the bottom of a 9x12-inch baking dish. Use a brush to spread about 1/2 teaspoon of olive oil in a thin layer up the sides of the dish. Place a crepe, dimpled side down, onto a work surface; spread about 1/3 to 1/2 cup filling onto crepe in a line down the middle. Roll crepe over filling and tuck in ends if desired. Lay filled crepe into the baking dish. Repeat with remaining crepes and filling to make 6 manicotti. 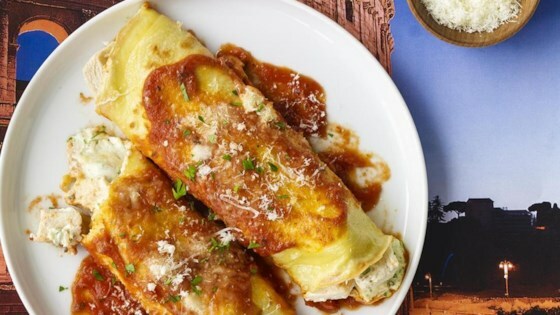 Spread remaining 1 cup marinara sauce onto the manicotti in a line down the middle of the crepes, covering middle 1/3 of manicotti. Sprinkle 1/3 cup Parmigiano-Reggiano cheese all over manicotti. Drizzle manicotti with remaining 1 1/2 teaspoon olive oil. Bake in the preheated oven until manicotti are slightly browned and puffy, about 45 minutes. Let stand 5 minutes to cool. Garnish with 1 tablespoon Parmigiano-Reggiano cheese or as desired and 1 tablespoon Italian parsley before serving. It tasted fine. Thought the cooking time was a little too long though. I made this twice before December and loved it both times. My wife wasn't crazy about the crèpes but I thought they were so tasty. I personally did not like these. Had a weird tang to it, probably since it uses left over turkey.